If we told you we were off to yoga on a Saturday night you'd probably think we'd gone a little Gwyneth Paltrow and spend the next week dodging our calls for fear of being lectured about your cocktail habit and preached to about the benefits of going macrobiotic. But worry not, if you spot us on a Saturday evening in Lulu Lemon rather than Louboutins with a yoga mat tucked under our arm where our oversized clutch would usually be, we're still off for cocktails and dancing we're just doing it Okimo style. When yoga instructor, Rachel Okimo heard back in 2010 that friends weren't trying yoga because they were put off by intimidating classes held in traditional studios, she decided it was time to give yoga a bit of a shake up and bring it into the 21st Century with a bang. Inspired by the eclectic music scene in Berlin, Rachel created Funk the Bhuddha, a fusion of yoga and live music that takes yoga out of the studio and into cool cultural spaces. 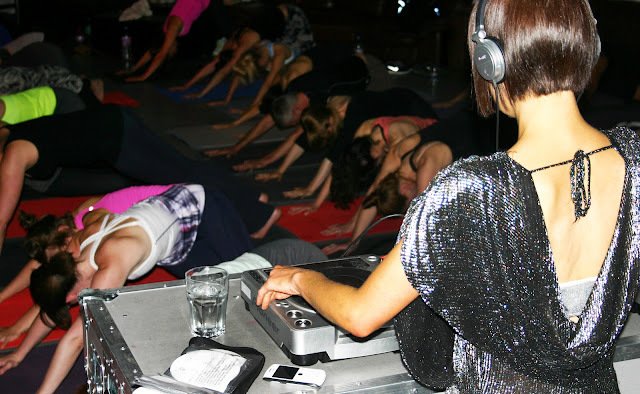 Rachel's now brought Funk the Buddha from Berlin to London and hosts regular Saturday nights around the city in unusual urban spaces so that yoga bunnies can Om while socialising to a killer soundtrack spun by the best DJs. Tell us a little about Funk the Buddha. 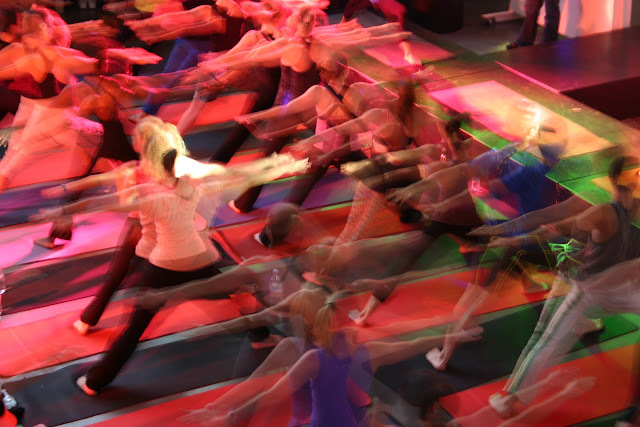 How is it different to a regular yoga class? Funk the Buddha was born from the clubs and art galleries of Berlin. It's a fresh, hip fusion of yoga and live music, held in cool and unusual spaces around the city. 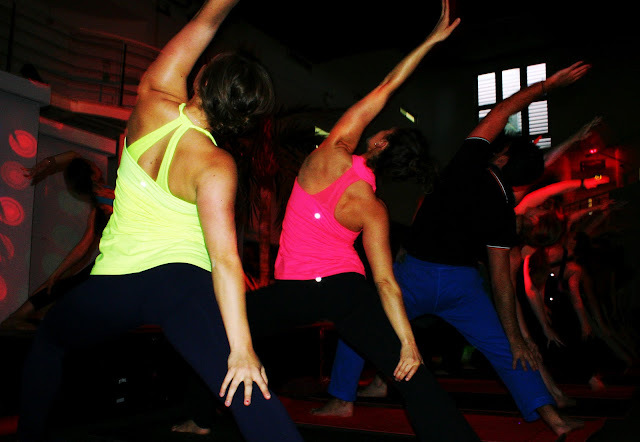 We give you a hip holistic workout in quirky pop up venues with music from some of Europe's finest DJs. It's definitely a yoga experience to remember. My unique fusion of funky dynamic yoga flow sequences, fun interactive games and carefully choreographed live music collaborations make for an energetic, heat inducing yoga that gets you rocking on your mat. You even get to break loose and dance as part of your practice! 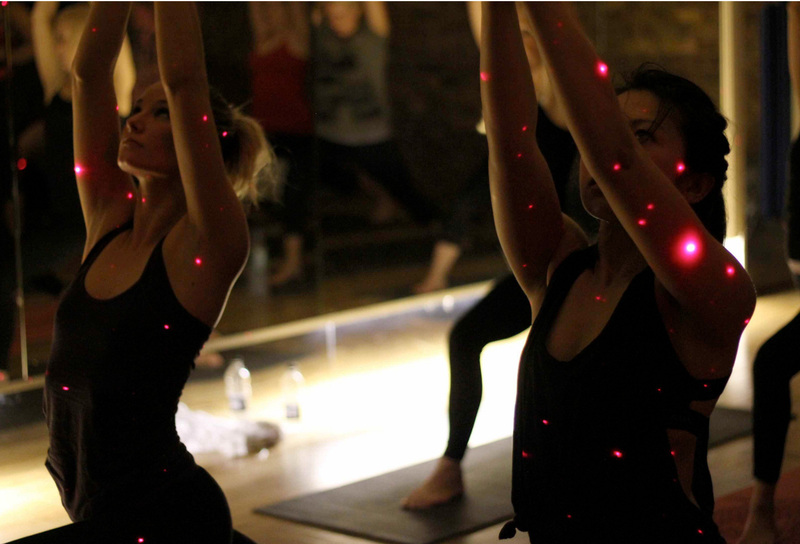 Funk the Buddha makes yoga a cool alternative to your usual Saturday night out on the tiles, offering a full work-out on the mat and providing the perfect environment to relax, refuel and socialise after your practice. We serve up delicious dining, cocktails and mocktails along with the chance to experience what's hot in the well-being world by showcasing yoga apparel, music, art and culture. Funk the Buddha brings the group yoga experience to the next level: out of the studio and into the playground of our cities bridging the gap between our yoga and social sanctuaries. Funk the Buddha is all about feeling good without forfeiting the fun! What's your top tip for any yoga newbies wanting to try it out for the first time? Funk the Buddha is an open/intermediate level: This means all levels practice together. Those who are new to yoga should do what they can and most importantly enjoy the experience. Both Funk the Buddha and my studio classes are designed to challenge at every level, the main goal is to move and get into your own body. Just let go, have fun and feel good about it! I'm a strong believer that you do not need to bend like a pretzel, be squeaky clean or relinquish all earthly pleasures to practice yoga. Funk the Buddha is not just about the yoga it is a creative wellness experience. Come for the delicious dining. Come for the creative inspirations. Come for the fab goody bags! Any funny or embarrassing yoga stories? My very first yoga class was an eye-opening experience! I came to yoga from a modern dance background and always thought of myself as strong, fit and flexible, so walking into my first yoga class I felt confident…that was about to change! After an introduction about breathing, the instructor directed the class into our first downward facing dog. After three breaths in what the teacher was calling ‘a resting pose’ I was soon shaking and quivering and wondering what I had gotten myself into. Needless to say my illusion of yoga being easy was promptly shattered and I spent the majority of my first yoga class in child’s pose! Despite my shaking limbs, I went back and have never looked back since. Other than yoga, how do you stay fit and healthy? Is yoga enough to get a Jennifer Aniston-like bod? My yoga practice is fundamental to my wellbeing, not just because of the cardio workout I get from my dynamic practice but also the balance of strength and stretch, plus the elements of breath and relaxation to complement the dynamic energy of a class. I support this good feeling by eating delicious, nutritious food and yes that includes a glass of wine or cocktail when I fancy it! My hope is that practicing yoga is enough to encourage us to let go of the idea of perfection so we can love and embrace the body that we have. Who in your opinion has the perfect body? I think the perfect body should only ever be the one you're in. I've always had an athletic body shape, so it would be fun to swap for a day with the icon of curves, Marilyn Monroe. It's great that curves are once again considered an asset! I’m sure my students who love my rocking yoga playlists would agree! My full teaching schedule means I am rarely out of yoga clothes, so at least I can look and feel good with this fabulous yoga apparel. Without them Funk the Buddha wouldn’t be the success it is today! 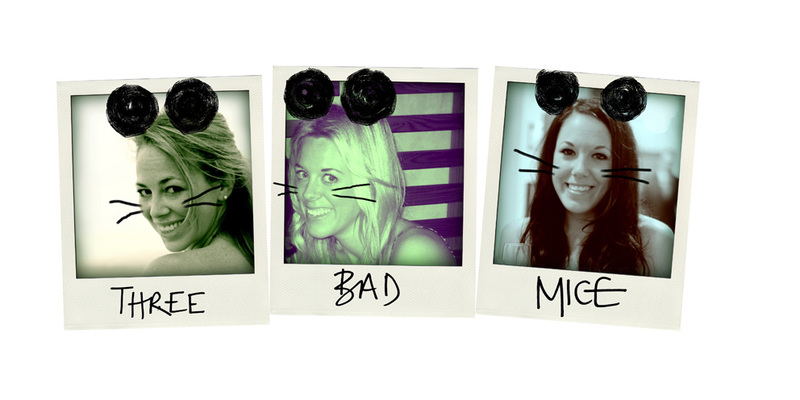 Describe your perfect London weekend? A walk along the river to eat good food and buy fresh produce at Borough Market. Catching a movie at the British Film Institute or performance at the Young Vic and then heading to my favorite tiny cocktail bar in Angel where a piano player tinkles jazz tunes. Sunday morning yoga - with my friend and favorite teacher Mercedes Ngoh - then indulging in an afternoon adventure with the ones I love.